From the Star Wars The Last Jedi collection by Hasbro. Star Wars The Last Jedi Kylo Ren Electronic Lightsaber. From the Star Wars The Last Jedi collection by Hasbro. Star Wars The Last Jedi Kylo Ren Electronic Lightsaber. 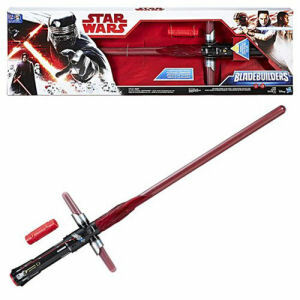 This deluze lightsaber features a pulsating light effect and authentic lightsaber power-up and battle sounds Bladebuilder system has interchangable parts. Ages 6 and up.